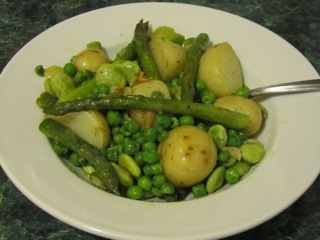 I made a cheats version of the original dish from “The River Cafe Two Easy” cookbook last night using frozen peas and broad beans and cooked potatoes but it was still delicious. Essentially the vegetables are stewed in the olive oil, not fried – a celebration of spring vegetables in one dish. I’m also having a hankering for artichokes with hollandaise – perhaps this weekend’s lunch?